By 2020, it is predicted that there will be a staggering 5.7 billion smartphone users in the world. And it’s easy to see why. Mobile devices are an essential part of our daily lives. You can do pretty much anything on your mobile – from seeing and talking to families and friends, to making all sorts of payments – online and mobile, shopping, buying food, and so much more. Aside from personal use, mobile devices are more and more essential business tool. 88% of Australians now own a smartphone. That makes Australia one of the leading mobile adapters in the world. Within 5 minutes of waking up in the morning, 35% of people are already on their phones checking emails, reading the news or checking social media. Such statistics suggest that mobile devices can become a distraction that hinders us, instead of one that increases productivity. But that’s simply not true. In this post, we’ll discuss all the opportunities that mobile devices bring to the workplace. In the workplace, one of the biggest benefits of mobile use is increased employee freedom and flexibility. With mobile devices, company staff can work anywhere, anytime – enabling them to decide how, when and where they can best work and deliver results. Productivity therefore is no longer limited to one office location. People can create and edit documents on the go remotely, respond to customer queries anywhere, or make business decisions on the run. Having the flexibility to work anywhere lets staff create a better work, life balance – resulting in happier, more engaged and more productive employees. Mobile devices greatly increase team communication and collaboration. Even while working at home or out on the field, staff members can coordinate projects and tasks with their teams. Mobile access to information content can be easily implemented and used by teams across the organisation – streamlining workflows, enabling real-time information sharing, and facilitating better coordination between team members. Mobile devices also allow remote workers to share media on-the-go through public or private cloud repositories. Employees can even attend virtual meetings, conferences, and training any time from virtually any part of the world. Need staff to access relevant and timely information? A mobile device literally puts essential data in their hands; whenever and wherever they need it. A salesperson can review relevant information stored in the Customer Relationship Management (CRM) system to close the sale. A project manager can approve the urgent invoice payment while on site. An accountant can log in to accounting systems remotely to easily lodge a Business Activity Statement (BAS). A company director can download the latest version of a presentation to secure the next round of investor funding. These are just a few examples of how mobile devices can enable employees to gain quick access to important information when needed – thereby enhancing productivity and effectiveness on the job. In today’s digital world, everything is moving at a quick pace. Everyone wants instant access to information and immediate responses to questions. Your customers are no different. They want their queries and issues to be answered and resolved swiftly and seamlessly. 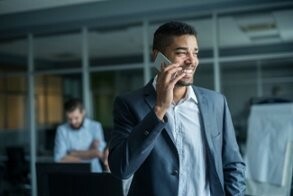 Mobile devices can improve customer response times by empowering employees to easily connect with customers. And with access to real-time data, employees can also make informed decisions quickly. For instance, sales or business development staff can be equipped with a tablet or smartphone that can access product and customer information instantly. This enables them to address issues on the spot, provide detailed information (like pricing) and offer instant technical assistance – resulting in better service and more satisfied customers. While the use of smartphones and tablets can have numerous benefits to staff productivity, they do bring with them the issue of mobile security. Mobile devices are always connected to the internet and have access to content that can easily be misplaced, increasing the risk of data breaches occurring. Have a documented policy (communicated to everyone) that clearly outline mobile device use and security requirements like passwords, device locking, application download and installation etc. (For more on security, download our security guide, or request an obligation-free security audit). Want more office productivity tips? The use of mobile devices is just one way to boost productivity in the workplace. For more on how to create a culture of productivity, download our Ultimate Guide to Office Productivity Hacks.